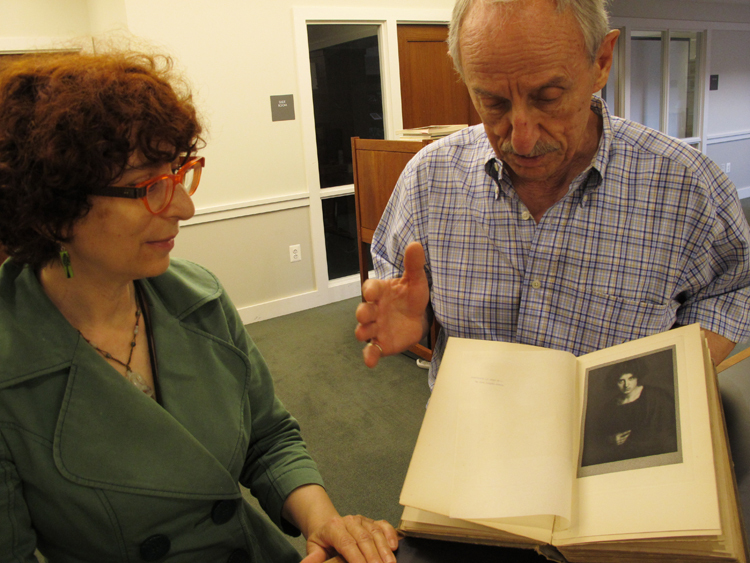 On the 131st anniversary of the birth of photographer Alvin Langdon Coburn, we in the library had the pleasure of a visit from collector and donor Raymond Machesney, who also might be Coburn’s biggest fan. (Take a look at the abundant gifts he has given to the Phillips, nearly all somehow related to Coburn.) As always, Raymond brought his infectious enthusiasm for this influential and sensitive photographer and guided us, along with curators Elsa Smithgall and Eliza Rathbone, on a journey through his latest gift: a first edition of The Artistic Side of Photography in theory and practice, from 1910, by A.J. Anderson. Coburn assisted Anderson in the selection of images for the book and this edition includes beautiful tipped-in photogravures by Coburn, Alfred Stieglitz, and Holland Day, among others. 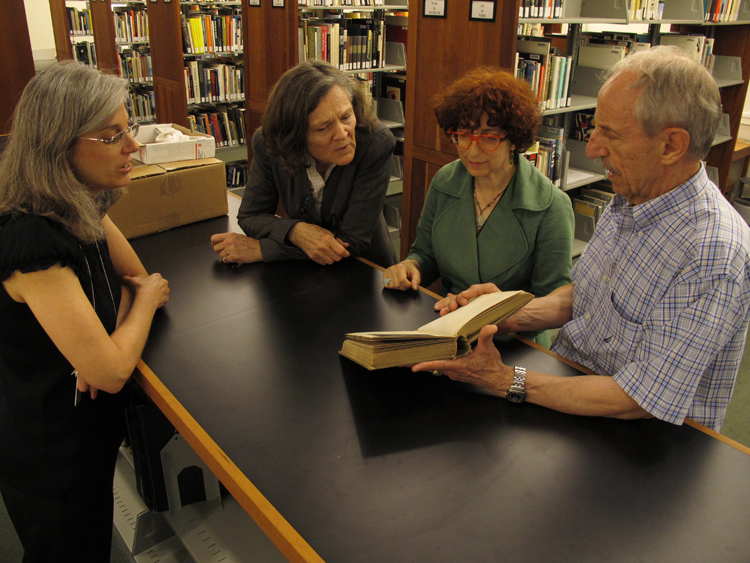 (left to right) Elsa Smithgall, Eliza Rathbone, Karen Schneider, and Raymond Machesney in the library. 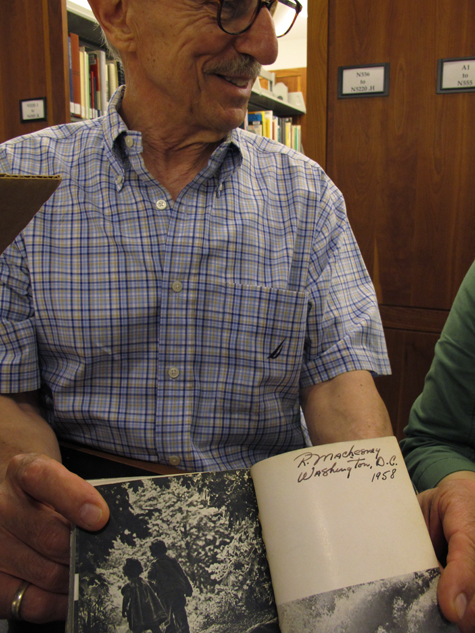 Raymond shows his inscribed copy of The Family of Man, purchased in D.C. in 1958. And, though not a gift, just as delightful was seeing a small volume Raymond brought with him, a pocket-sized edition of the catalogue for The Family of Man. Raymond bought the book in 1958 on a summer study trip to Washington, D.C., while on break from his full time studies in Ohio at the College of Wooster. A political science major at the time, he found the book appealed to his social interests rather than any artistic sensibility. What else happened on that trip to Washington? Raymond paid his first visit to the Phillips. We are glad he did.